Looking for a gripping read? Here’s one: A Stolen Life – a true story about how the author was kidnapped as a child and returned to her family eighteen years later. 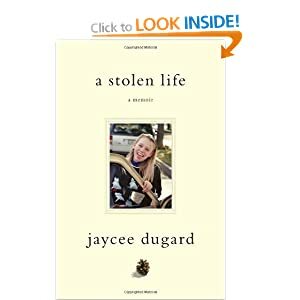 When Jaycee Dugard was eleven years old, she was abducted as she walked to a school bus stop within sight of her home in South Lake Tahoe, California. She was held captive by Phillip Craig and Nancy Garrido for over eighteen years, and gave birth to two daughters while imprisoned. In, 2009, Garrido brought Jaycee, her daughters, and his wife Nancy with him to a meeting with his parole officer. Their strange behaviour aroused the officer’s suspicions and the subsequent investigation revealed the tent behind the Garridos’ home where she had been living for nearly two decades. She was reunited with her mother, along with her two daughters, as she had dreamed of throughout her captivity. Awful things happen to Jaycee while she was kidnapped, but the book focuses on her resilient spirit instead. What she went through will make your problems seem like roses in the sunshine. Your boring job, massive debt or messed-up family will seem minor in comparison to the problems this kid faced. Embrace life! Jaycee does, in spite of everything.